If your gift list includes avid readers, take heart. We’ve found extraordinary presents for every reading geek. In fact there are so many delights, it’ll take us a few days to share them all. Bookmark this list to use beyond the holidays and to satisfy your own reading-related hankerings. Check out chapters two, three, and four in this guide. 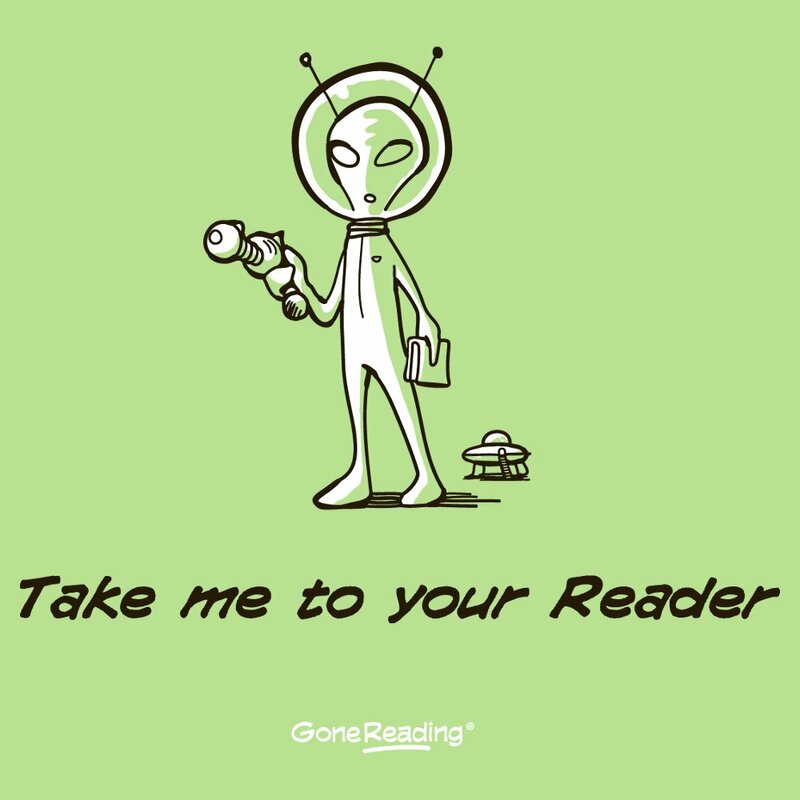 Take me to your reader t-shirt ($19.99) from GoneReading. This clever t comes in men’s, women’s, and kid’s sizes. There are many more enticements offered by Gone Reading. Literary action figures, book club gifts, car window decals, journals, and games, just to mention a few. Better yet, 100% of their net profits are donated to reading-related charities. The founder was inspired after helping to build a library in a remote area of Honduras and now funds libraries both in the developing world and in the United States. We particularly adore the Sherlock Holmes action figure ($11.99), wooden dinosaur bookends ($36.99), and the evolution of reading t-shirt ($19.99). Penguin e-reader cover ($35) from the Etsy shop BagChemistry. 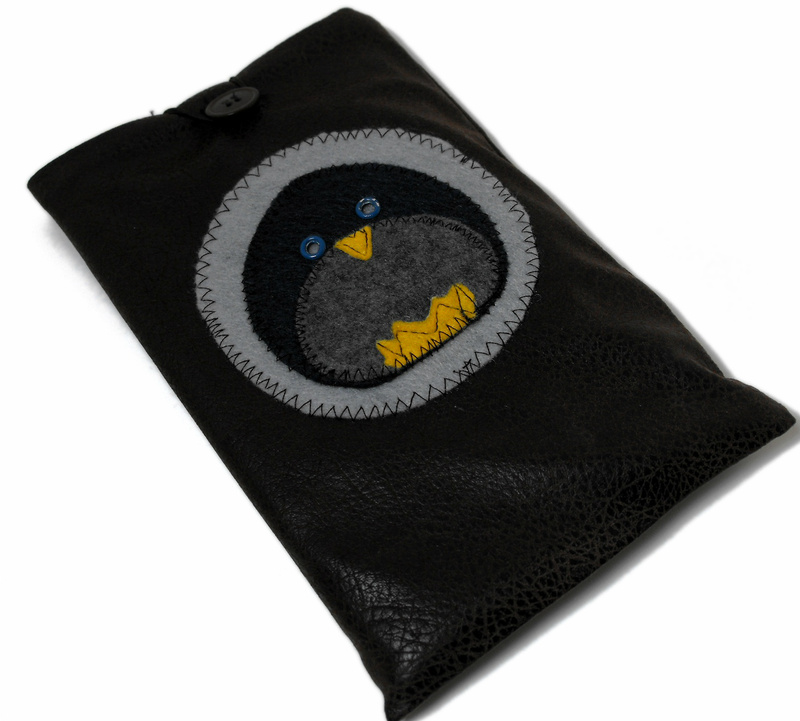 The exterior is brown micro-suede, the applique and lining are eco-fi felt made from 100% post consumer waste plastic bottles. This sleeve is handmade and full of personality. Peter Pan sterling silver quote charm($45) from the Etsy shop Swirls by Elisa. 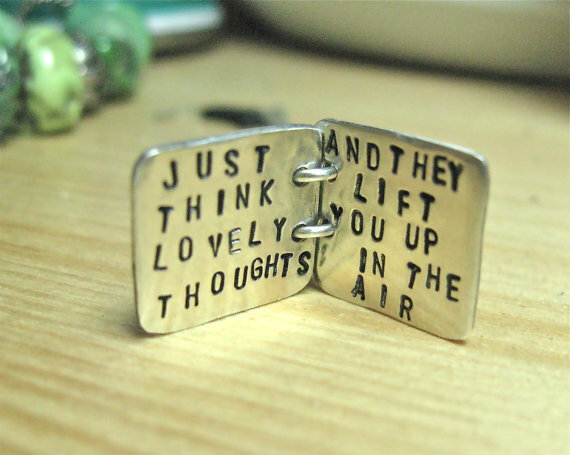 This charmingly tiny handcrafted book opens to the quote “Just think lovely thoughts and they lift you up in the air,” spoken by Peter Pan in the classic J.M. Barrie story. It can be worn as a necklace or charm, reminding the wearer of the magic of books. Elisa will make you another one if she runs out! The right stand to hold a book, e-reader, or tablet. That way the strain is gone when you (or anyone on your guest list) prop it up with the perfect bookrest. 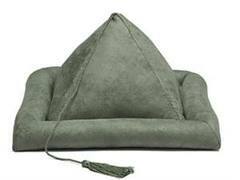 The Hog Wild Peeramid Bookrest ($27.68) is a pillow-soft stand in, you guessed it, a pyramid shape. It’s easy to use in your lap or next to you as you lie down. It comes in nine colors, topped with a long bookmark which isn’t too useful to keep your place on a screen but might make your cat happy. Or consider the IPEVO PadPillow ($39.74) which can change shape to suit what you’re reading. It comes in six colors and is the only one we’ve seen with a removable, washable cotton cover. That’s a big plus in a home with kids or for anyone who reads with coffee (or wine, or whatever) at hand. For versatility, check out the Lap Pro ($25). It holds whatever you’re reading, even magazines, but wait, there’s more. It can be used as a travel pillow. It can work as a tote to carry slimmer cases. And its micro-fiber fabric can be used to clean screens. Another stand worth considering is the Thai Pad ($39) and smaller version TeenyTiny Thai Pad . Both are made out of silk by artisans in Thailand, based on traditional designs. Each purchase benefits the International Reading Association’s literacy programs in Thailand. 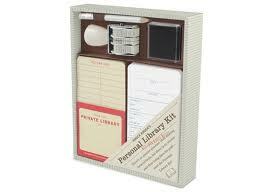 Knock Knock Personal Library Kit ($14.42) revives library circulation techniques for the fun of it. The kit includes self-adhesive pockets, checkout cards, date stamper, inkpad, and keepsake box. Bibliophiles of all ages can more easily share books knowing a return date is stamped right on the card. A pack of two refills is also available ($11.50). Kids may just set up their own libraries, and for anyone old enough to remember libraries of yore it’s a blast from the past.